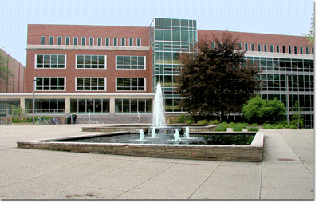 The Main Library is located on West Circle Drive, south of Grand River Avenue in East Lansing. The Library has two entrances, the Beaumont Entrance on West Circle Drive and the Red Cedar Entrance on the south side of the building facing the Red Cedar River, which has a ramp. The Main Library is open continuously, starting at 10 am on Sundays to 10 pm on Fridays during Fall and Spring semesters, with special hours on Saturdays and during holidays. Branch libraries and specific service desks maintain unique schedules. To verify the library is open, please see the complete hours listing. Public parking is available in the lot next to Spartan Stadium south of the Library on Red Cedar Drive at Visitor Parking Lot 62. From 7 a.m. to 6 p.m. Monday through Friday, the parking lots and spaces near the Library off Circle Drive are reserved for vehicles with faculty/staff parking permits. Virtual tours of the Main Library’s first floor and Digital Scholarship Lab are available to view before visiting.